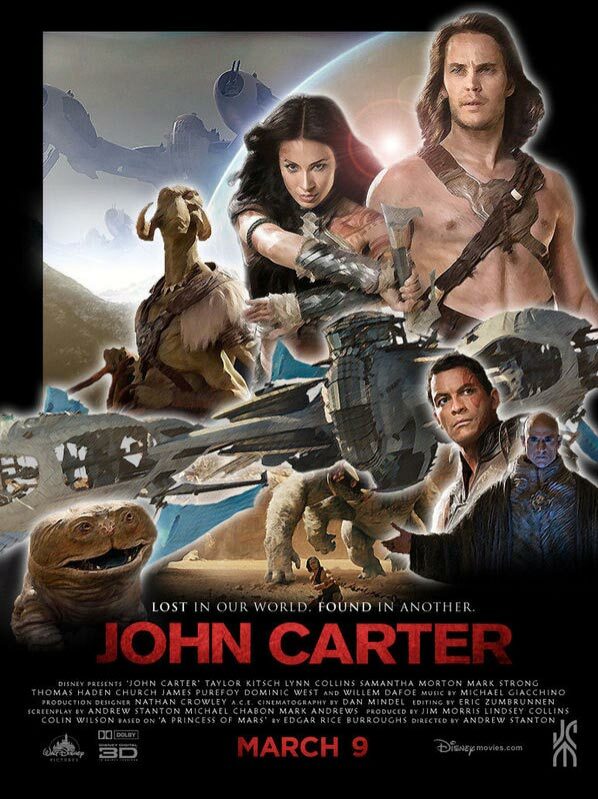 I really wanted Andrew Stanton's John Carter to be good. And it's pretty good. It's not terrible. It deserved better than it got in the market, I think. But I can see now what really holds it back from greatness. And it holds a great lesson for any GM (and plenty of other story-tellers, too). It's a lesson I myself have struggled to remember, time and again. You just don't hate the bad guys enough. And for a fantasy adventure story you need bad guys you can really hate. And in a fantasy adventure movie, you need to get to the hating right away. Your audience needs to HATE. That's the lesson: a great fantasy adventure needs massively hatable bad guys. Why is it especially important to get right to the hating in a movie? Because movies are really short, and they operate visually. Every second your audience spends trying to distinguish characters from each other is a second in which you've lost the opportunity to make them care. Important characters must be immediately distinguishable from others. Visually. We have to understand their relationships and our own feelings about them viscerally, not through explanation. Let's compare the opening of John Carter with a couple of other films that I think are trying to tell similar sorts of stories, and did so magnificently: Star Wars and The Fellowship of the Ring. Both of these films, like John Carter, start by setting up a large-scale conflict that will draw in our unsuspecting hero. Over the course of the story the heroes will come to take on the conflict as their own, and prove to be essential in its resolution. What's crucial, then, is that the audience care about the conflict. They need to be emotionally invested in the outcome of the conflict. And this has to happen fast, because, as I mentioned, movies are short. When you've only got a couple of hours to build that emotional investment, every moment of confusion or uncertainty in the audience reduces the potential impact of the story. The opening shot of Star Wars is rightfully one of the most classic openings in cinema history. Not only is it a fantastic technical achievement, but it tells the story right away. There's these scrappy little guys in some sort of ramshackle arrangement, and they're getting pushed around by these big bullies in this ENORMOUS HELLO I WILL EAT YOU spaceship. You know right away whose side you're on, of course, and that impression gets steadily reinforced as the opening scene plays out: kindly-faced Rebel soldiers looking worried as they get steadily gunned down by visored unstoppable soldiers, and then DARTH VADER appears all in black with a skull mask, and he murders some guy and then intimidates the plucky princess. Later on he will strangle some dude and BLOW UP A PLANET. And THEN he kills Ben. Jeez Louise. We understand quickly that he's the bad guy, we hate and fear him immediately, and we are repeatedly shown reasons to continue hating and fearing him. We REALLY want Luke to get rid of this guy, even though it seems totally impossible. And we immediately recognize him later on, and we feel that hatred and fear without having to think about it. One of the best things Peter Jackson ever did was to understand exactly who the bad guy is in The Lord of the Rings, and the opening of Fellowship makes it very clear. The battle between Isildur and Sauron, Isildur's moment of weakness at Mount Doom, and his subsequent betrayal, all of this tells us right from the get-go who the terrible trouble-maker is: the Ring. The Ring is bad, and we know it five minutes into the movie. We've seen it doing bad things, and we fear and hate it for the rest of the film. 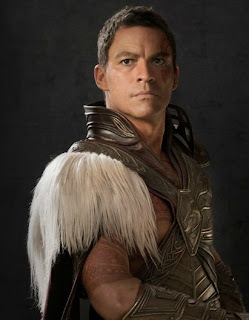 other guy in the movie. Sab Than inspires neither fear nor hate. He's not doing anything that obviously needs to be stopped, and stopping him doesn't look any harder than stopping another random guy with a sword in a flying airship on Mars. "But," you say, "Sab Than's not the real bad guy! This story is all about Matai Shang!" Okay, so Matai Shang shows up, and yep, he's visually distinctive, at least. And he can apparently fly. And he gives Sab Than a big blue glove and says "This is awesome." So Sab Than tries to blow up Matai Shang with it, and nothing happens. So that's not very impressive. We're still left with no real reason to hate Sab Than or Matai Shang, and Than's foolishness only makes both of them even less fearsome. And Matai Shang changes appearance constantly through the movie, which undermines the point of his distinctive appearance. The whole point of giving a primary character a distinctive appearance is so that you can steadily build up an emotional association in your audience. When they see him, they see him doing something awful, and they hate him even more than they did before. They build an association between that feeling of disgust and his appearance. Every time he appears in some other guise, that association is made less intense. So Shang's constant shape-changing undermines what's already a problem about this film -- our lack of emotional investment in the conflict of which he is a part. And Shang never appears to do anything all that terrible, anyway. Nor does Sab Than. Oh sure, there's killing guys, but war is hell, right? And there's TALK about vague, terrible things, but we don't SEE any terrible things, so we don't develop any association between these characters and a sense of disgust or hatred. They're not blowing up planets and torturing plucky princesses. They're not corrupting brave warriors or whispering to Ringwraiths. They're not doing much of anything, it seems. I'm not trying to hate on John Carter. I like the movie. Stanton's takes on both Carter and Thoris are fantastic, and both actors do a great job bringing two of my most beloved characters to life. The action scenes are well-played and the Tharks are other beasts are awesome. But this is an instructive lesson, I think, for storytellers of all stripes, including GMs. It's hard to create truly memorable villains in an RPG, since so many games are crafted around the idea that the players will win every encounter. That means that upon meeting the bad guy, they will defeat him, and so there's rarely much of a chance to really build up that sense of hate and fear. But how do you introduce bad guys, get your players to hate and fear them, without making it an immediate fight to the death? How do you delay the action of justice so that it's all the more satisfying when it happens? One of my most memorable bad guys was an accountant. There's something about accountancy that helps keep players civilized, maybe. I often outright tell my players to not try fighting a bad guy out of their weight class. My reasoning is that the characters are receiving far more non-verbal information than I can give the players, and so they have access to an understanding the players do not. So if I say, "You're very sure this guy will beat you all to a pulp if you look at him sideways," that's just their characters understanding some cues that are hard to express through the sort of narration available to a GM. Once the players are willing to let the scene play out, I find it much easier to build up bad guys they can really hate. But are there better ways to do this? Do some games handle this better than others? So we've talked about the two main types of Tags: Stunts and Connections. Stunts are things your character has or can do -- talents, items, magical powers, whatever. Connections are ways in which your character relates to or supports other characters in the group. These are the basic character elements in Initiative! Tags are how you improve your Trait rolls. Every time you make a Trait roll, you can add one of your Tags to it. Simple enough, right? Well, there's a third type of Tag: the Local Quality. Local Qualities are Tags that are connected to a particular location: a crowded tavern or a storm-tossed pirate ship deck or whatever. They are elements in the scene that heroes can use to dramatic or cinematic effect. 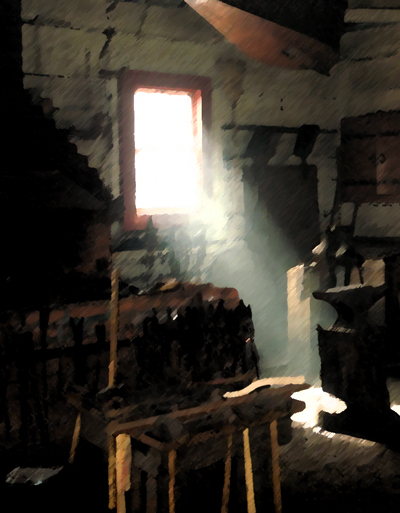 A Local Quality can be ANYTHING: a physical characteristic of the locale, or a quirk of one of the NPCs, or just a declaration about how the action here is going to manifest. Once established, any player can choose to apply the Local Quality to any Trait roll. This counts as their Tag for that roll, but there's a little wrinkle to this: Action Points. Of course Initiative! has an Action Points mechanic. Giving players a currency they can choose to apply for advantage at their discretion is a great idea, and works well in lots of games. In Initiative! a player can spend an Action Point to use a second Tag on a given roll, OR to create a Local Quality (and apply it to their roll). Once a Local Quality is created, anyone can use it at its current rank just like any other Tag. But if they invest an Action Point, they get to increase the rank of the Local Quality (or create it from scratch) AND add it as a second Tag to their roll. So there's an interesting choice here for a player -- they can use their Action Points to add one of their existing Tags to a roll, but get no ongoing benefit, OR they can invest in something which may not be as potent (all new Tags always begin life at rank "Good"), but which other players can not only make use of but also invest in. And as they invest in the Local Quality, it gets more and more powerful. Cam Banks started a "swashbuckling" conversation on Google Plus recently, and one of the ideas that came up was the notion of introducing "themes" into battles, whereby for example, "tabletops" are the theme and so any action that involves them gets a bonus. Local Qualities allow for that sort of play -- somebody can establish a Local Quality (say, "Pit of Barbecuing Pigs") and then not only do players make use of it, but they are incented to make it steadily MORE impactful over the course of the scene. And of course in Initiative! combat and social scenes are handled in exactly the same way, so you can establish Local Qualities in the midst of a delicate negotiation and have the same impact. The goal of Local Qualities is to give players new options in each scene that they can make use of for their characters' awesomeness. Since Local Qualities evaporate at the end of the scene, they can make an individual fight much more memorable. Initiative! is meant to be a simple, freewheeling game of memorable stories, so the hope is that the combination of Stunts, Connections and Local Qualities allows for exactly that. I like the "niche protection" ideas of games like Old School Hack and Leverage, where each player fills a clearly-defined role on the team and the roles are all designed so that each hero has abilities that only they can use. Everyone gets their share of "spotlight time," which is a great thing at any table. But a lot of the games I run don't have those sorts of ready-made niches that you can easily carve out. DINO-PIRATES OF NINJA ISLAND, for example, ends up handling parties made entirely of swashbucklers competing to out-buckle each other's swashes. That's kind of part of the fun. And niche protection is different from relationships, and relationships are much more interesting to me than niches. I want a game where the relationships between party members can be as important as the skills and abilities of the individuals who make up the party. I found Apocalypse World really interesting this way, and successful at generating interesting and playable relationships between PCs. Initiative! encourages strong relationships between characters, and using those in play, and investing in them as much as you would your character's abilities. Indeed, those relationships can actually BE a character's abilities. In Initiative! those relationships are called Connections. Connections are the second kind of Tag in Initiative! -- the fundamental characteristics that you use to flesh out your character. We talked last time about Stunts, but Connections are a little more complicated. When you create a Connection, you benefit at least TWO characters (you and the character you're connected to), so you each get a benefit at a lower cost than if you'd each invested the same in your own characters. Further investment in that Connection is likewise cost-effective. In addition to the usual character sheet most role-playing games require, Initiative! also has a GROUP sheet, where all the Connections are noted. Every Connection has three elements: a quick one-line description, a Rank and a list of the characters connected. The description is how you decide when a Connection is relevant. Stunts have exactly the same thing. So for example, you can create a Connection with another character and call it "To The Emperor!" -- perhaps thinking this is a toast you and the other character always use as a signal between you. So any time that toast (or any other implication of the description) comes into play, you can apply the Connection. Applying the Connection allows you to add the bonus associated with the Connection's Rank to your roll. Higher Ranks mean higher bonuses, so it's worthwhile to spend some energy building up your Connections. Connections are even more potent when used to aid one of the connected character's rolls. When you use a Connection that way, its Rank is increased by one for that roll. All the connected characters share the Connection's Rank, so if any one of you increases it, that's an increase you all get to share in. Being a good team player is its own reward! There are some limits to all this goodness. A Connection is tied to a Trait, and you can only have one Connection per Trait. In addition, you can only have one Connection per team member. Finally, a single Connection can only connect a maximum of three characters. The goal is a network of Connections that draw all the group members together, and encourage coordinated action. Of course this needs lots of playtesting, so it will probably undergo lots of change, but I'm hoping the basic idea will get a lot of use in play. Are there other games with great relationship-building mechanics? A thousand years ago, rumour spread that the greatest swordsmith in the land had created four perfect blades. Stronger than any other swords, sharp enough to cut through stone, and as beautiful as the sky at noon. The rumour said he'd named the blades the Four Steel Demons. Rumour reached a gang of heartless bandits, who rode that very night to the swordsmith's home and demanded he give them the swords. He refused, and they cut him down and took the Four Demons for themselves. They butchered his family and burned the entire town to ashes. In the years that followed, made unstoppable by these peerless blades, the bandits unleashed hell on earth, cutting down all who stood in their path. They revelled in slaughter and nightmare, and the land itself ran with blood. Only once they fell to fighting amongst each other did the reign of terror finally end. All who'd heard the rumour cursed the smith who'd made those blades. But the rumour had been untrue. The smith had not made four perfect blades. And now, a thousand years later, the Four Demons are stirring once more. Only the Steel Angel can stop them -- if a hand can be found to wield it. Great, because what I need right now is ANOTHER idea. So when I first started talking about this new system I'm tinkering with, I mentioned that each character was defined by five Traits: Deadly, Compelling, Quick, Cool and Aware. Of course you characters can get more specific than that. The primary way you define your character is through Stunts. A Stunt is like a shtick, or a signature move, or a strength, or anything that gives a bit of colour to HOW your character manifests one of the basic Traits. Is he Deadly because he has Fists of Iron? Is she Cool because she's Single-Minded? Stunts are descriptive notes that you use to improve your character's chances at success -- or even to ensure success when you really need it. Each Stunt is attached to a Trait. So you have Deadly Stunts, or Aware Stunts, or whatever. When you make a Trait roll, you get to apply one Stunt for that Trait to the roll, so it's good to have Stunts spread across your Traits. Each Stunt also has a Rank. See, Stunts and Traits are both Qualities -- and Qualities are the building blocks of the Initiative! system. Quality Ranks range from the bottom of Fail to the top of Mythic. Each Rank has a corresponding Modifier and a Target number. When you make a Trait roll, you add the Modifier for the Trait's Rank. If you have a relevant Stunt, you can add its Modifier, too. Remember, I want this game to be simple. So there can't be long lists of Stunts to choose from. Instead, you can make up your own Stunts -- a Stunt can be anything you want it to be. The basic guideline, though, is that your Stunts can't just mean MORE of the Trait they apply to. That is, you can't have a Deadly Stunt called "Super Deadly". Stunts describe HOW your character operates in a Deadly fashion. The rule of thumb is that a good Stunt must have obvious conditions under which it would NOT be useful. If you can't easily come up with a situation in which you're using Deadly but would not be able to use the Stunt, it's probably a bad Stunt. Now I also want this game to be freewheeling. So there's an Action Point mechanic, like in many games. What these points allow you to do is apply more than one Stunt to a given roll. The second Stunt can be from any Trait, although you'll be required to explain its usage here. The big deal with these Action Points is that you can use them AFTER the roll is made. So if you fail by only a small amount, you can spend an Action Point and draw in another Stunt to ensure that you succeed. So you're having to do some fancy narrating at the table, but you know you're doing it for a win. I've used this type of mechanic for years with DINO-PIRATES OF NINJA ISLAND, and am convinced that a post-roll opportunity is a great way to encourage in-play creativity. So there you have it! Stunts, part of the core of the Initiative! system -- more details coming soon. Well, the other day I posted a bit of a tease about how this new game system I'm thinking about is going to work. I wanted to lay out some basics, just so you understand where I'm coming from and what I'm trying to achieve with this. Design decisions only make sense in light of specific constraints or objectives. Initiative! is meant to be a simple, freewheeling game of teams overcoming evil. Freewheeling implies interesting options at the table, the ability to create new stuff in the story and to combine things in unexpected ways. It's about teams, because not many games do the team concept really well, and it's something I think deserves more game design impact at the table. I'll get more into how I see that working down the road, but it's a part of the system I'm really excited about. For right now I don't have a story concept more complex than "overcoming evil." You could use it just as well for overcoming good, I suppose. But while Initiative! is a generic system, it still assumes a story that is about a group or a team that work against opposing forces in order to accomplish their goals. I'll be posting more detailed outlines of how the system works over the next couple of weeks. Any feedback will be very welcome! In honour of National Game Development Month, I thought I'd share a new basic mechanic I've been tinkering with. I call it the Initiative system. It has its roots in Fraser Ronald's very fun Sword's Edge system (which powers Kiss My Axe and Sword Noir), but has a much crappier name. One of the ideas in Sword's Edge is that only players ever make rolls. In combat, you're either on the offensive or on the defensive, and the rolls you make are either to inflict or avoid damage. It's a unique way of thinking about modelling conflict, and it occurred to me that this idea could be expanded to cover ALL situations. What if the key mechanic in a game system revolved around possession of "initiative"? What if in order to accomplish things you had to acquire and act with that initiative, and failing to get it, or losing it, would force you to try and regain your cool? We see this all the time in situations that aren't physical confrontations. When one person gets rolling in a debate they can steam-roller their opponent, sway the room to their side. Many of our social institutions contain elaborate rules to try and limit this effect, precisely because it's so powerful. And when you don't have that initiative, when you're stammering and struggling to make a response, always on the defensive, it's very hard to advance your own agenda. So Initiative is meant to try and model that aspect of getting along in life. You have five Traits. Two are Active Traits -- Deadly and Compelling. Two are Reactive Traits -- Cool and Aware. The fifth Trait is Quick, which is what you'll use to try and gain the initiative. At the start of any confrontation, all the players roll their Quick to determine if they have initiative or not. Those who do can use Deadly or Compelling; those who do not can only use Cool or Aware. In the Initiative system, all results have degrees of success or failure. This comes into play here. If you're making a Deadly or a Compelling roll, success means you "inflict damage" on your opponent -- essentially, you advance your position while damaging theirs. If you're making a Cool or Aware roll, on a success you resist any efforts to do damage to you. If you succeed really well on a Cool or Aware roll, you might be able to take the initiative (allowing you to make a Deadly or a Compelling roll next round); likewise, if you fail really badly on a Deadly or Compelling roll you might lose the initiative this round. There's more details, of course, but that's the heart of the system. It's a very different sort of model than most simulationist games, I know, but once I got the hang of the basic idea it really took hold of me. When working against natural phenomena, or anything that isn't an independent agent able to respond to the players, the players always have Initiative and can use any Trait they want. I'm toying with the idea of allowing Quick rolls at all times -- that Quick can be both Active and Reactive (inflicting and resisting damage, basically). I'm worried that will overload Quick and make it the only Trait worth investing in, however. Am definitely thinking about ways to implement this in new games. I think it suits any game meant to tell high-action stories in which conflict, success and failure form the driving narrative. We are making a comic book, and YOU can help! REFORM SCHOOL NINJA GIRLS is a new comic book written by Corey Reid and drawn by Dave Knox. The script is written, the characters are designed, and we're finishing up an 8-page Prologue right now, but we need $10,000 in order to make finishing and printing the book a reality. This story is about five awesome ninja girls and their stuggle to do the right thing and save the day, even when nobody will believe in them. There's action and suspense galore, and beautiful art to go along with it, and we can't wait to share it with everyone. The world needs more ninja girls! And YOU can make it happen! We've gotten a long way already. We have a script that covers four full issues (with plans for many more), top-notch character designs, a wild fantasy setting (that you can contribute to), and we've posted an eight-page full-colour prologue on our website for everyone to read. The $10,000 we're raising now goes straight to paying Dave, our artist, so he can work full-time and finish up the first issue. We have some really cool rewards for our backers. Of course everyone gets a copy of the book when it's done, but we'll also have pins for different ninja clans, so you can show your ninja pride, an exclusive sketchbook of art and writing, or even original art and the chance to make up your own ninja clans that will be featured in future issues of REFORM SCHOOL NINJA GIRLS. If we make $12,000, we'll make sure every backer's copy of the book has an exclusive cover only for backers of the Indiegogo campaign. Your book will be a real collector's item! If we make $18,000, we'll do the whole book in GLORIOUS FULL COLOUR!